All turned in to the exchange coordinator, so I can move on to creating other prints. Although I have urges to do an etching on metal plate of the same drawing, just because I can. Or think I can. It all depends on if I get my etching press balanced this weekend. Medium:Woodblock print (hand rubbed or pulled on a press, B&W or colour, any pigments, any paper). Note: The Baren Exchange is a program for forum members to create, exchange and display editions of woodblock prints. Relief prints pulled from wood substitutes and wood-like materials, including linoleum, corian, MDF, resingrave, and similar are acceptable as are collagraphs. Coordinators are obligated to reject prints whose primary method of production is by other means. For example: monotype, intaglio, stencil, lithography, ink jet, laser, photocopy, etc are to be rejected by the coordinator. Six colors over three lino blocks. My registration technique needs work, but all in all, I'm almost feeling brave enough to tackle a moku hanga print. I used the same methods on the lino blocks, so now I just have to get some good quality knives and gouges to carve the wood blocks. 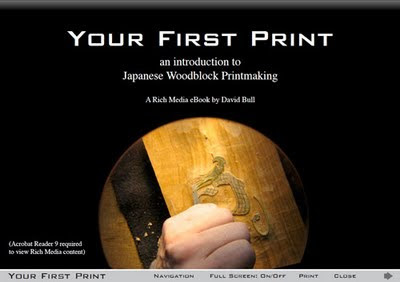 I just ordered a wonderful eBook from printmaker David Bull called Your First Print. It's basically a "complete overview of the making of a woodblock print using the traditional Japanese techniques." Just in case anyone out there *cough* Anonymous *cough* had a sudden urge to delve into the ancient art of Japanese woodblock printmaking. Because having hobbies like spinning sheep and dog fur into yarn just isn't enough for some people . . . . I must admit,Jimmy Hoffa will be found before I "delve into the ancient art of Japanese woodblock"
You should take something for that cold! C'mon, Bro, there's more to life than ham radio - isn't there? ?